i found myself at Super H-Mart the day after tetsujustin's recommendation. it's is an impressive supermarket, period. the fact that it is an asian/korean market, it doesn't stink at all, and it's super clean makes it even better. my mother tells me it opened on may 1st in a building which previously housed a randall's. a quick google search on the web revealed that it is part of a large chain of korean grocery stores nationwide. there are 26 locations currently in cities such as denver, seattle, and philadelphia with another 6 slated to open. the food court is modern and impressive. flat screen tvs and professional marketing materials adorn most of the food stalls. the bakery was so popular that everything was almost sold out. next there is a counter that sells bubble tea. after that, a korean fried chicken franchise, then a chinese stall, a sushi stall, a place that sells korean snacks, a dumpling place that wasn't opened yet, and lastly a korean food stall. 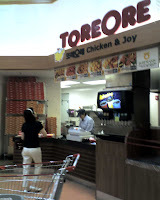 the korean fried chicken franchise, toreore, only sells chicken right now (no sides), but i like their motto, "chicken and joy." you can buy 7 or 14 pieces only and the pieces are small as they cut the thighs and breasts in half so they are about the size of wings and legs. orders come with a side of pickled white radish. get the #6 which is the HOT sweet & spicy fried chicken. i was warned twice that the chicken was really spicy. her third warning in which she told me it would make me cry, didn't deter me either. it only made me anxious to get some in my mouth. the chicken was tender and delicious and i found myself breaking a small sweat on my second piece (no tears though). 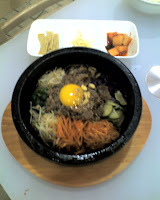 from the korean food stall on the opposite end of the food court, we also ordered a bibimbap with beef which came in a heated stone bowl. it definitely beat the one i've had at komart. the sides (banchan) included sliced fish cake, julienned potatoes, and cucumber kim chee. it came with a bowl of miso soup. 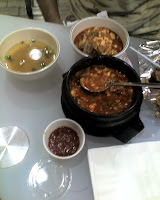 we also ordered the soft tofu soup with seafood. it was good but not as good as the tofu village version. 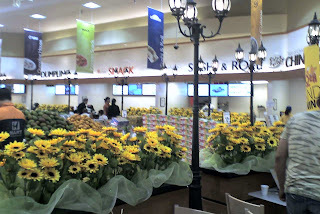 within the supermarket itself, the produce and seafood departments were impressive. 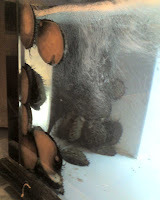 i saw live abalone! 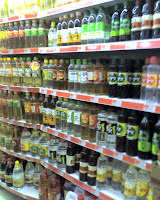 also, the selection of chili sauces and vinegars was amazing. my friend and i were giddy as we left H-mart. our bellys were full and happy and we were just delighted to discover this new gem in town. i can imagine komart is going to suffer with it's new neighbor down the street. You are right. This place does not stink like most oriental markets with their filthy restrooms. We will see a shake down soon. thanks for sharing this Article.it so useful for me. I want to share aboutMainFoodStore.this is nice restaurant in Houston. visit the official southbound food radio show website for podcast links. remember to tune into AM 1560 on saturdays at 11AM or stream it live from 1560thegame. the houston chowhounds is an eating club of composed of foodies in the houston area that enjoy exploring food-related obsessions together. if you are interested in joining, follow this link. Find me on Twitter @foodiehouston!